In today's scenario, competition is at peak, be it at any field. In the country like India where the supply of opportunities are considerably less with regards to its demand, only guided efforts are more likely to excel. Preparing for any exam is never an easy task. Resource collection, optimum study plan, quality tutorials, practice exercises, tips & advices, on-time notifications are all tough issues to manage with their sky high cost. JagranJosh.com also assists aspirants in post examination guidance; admission related queries and real insights for choosing right institutes. JagranJosh.com has a team of highly expert domain focused content researchers, developers & editors with sound understanding about various topics. JagranJosh.com is always committed to keep its content most updated & student friendly with state of the art personalized distribution pedagogy. 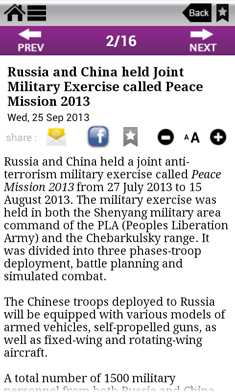 This section is also available for Android based smart phone users, to access features even on the move. We cover all the sections of the exam viz. Quantitative Aptitude, Verbal Ability, Reasoning, Data Interpretation and General Awareness; Group Discussion & Personal Interview. This section is also available for smart phone users through Google Play store. This resource section is focused on the preparatory material Mathematics and Science Subjects, developed exclusively for the students of Classes 9, 10, and 12. These are some highlighted features of this section. Also helpful for aspirants aiming state level civil service exams. This section is also available on Google Play platform for Android phone users. One of the most popular sections at JagranJosh.com platform with rich & updated facts about current affairs & G.K, relevant for most of the competitive exams at various levels. 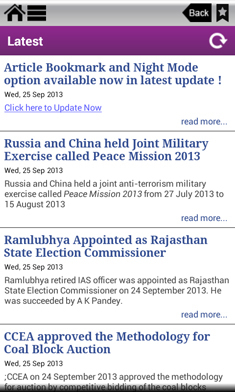 Current Affairs Apps are also available on Google Play store for Android phone users in English & Hindi languages and are best rated by App users. Jagran Josh has been ranked No # 1 "Website for Current Affairs in India"
Hindi Current Affairs section incorporates all the newest activities from the exam`s point of view. 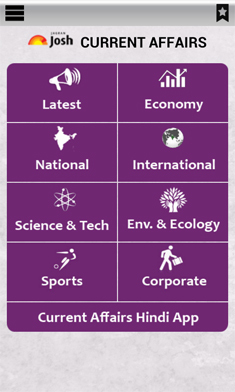 These activities at National as well as International levels include the areas of policy, economy, sports, science, technology, environment, ecology, corporate, awards, committee, commissions, Invention, Culture, appointment, death, etc. along with their background information. A candidate gets complete and enough current affairs study material in Hindi language. Tips and strategies for preparation of the respective exams. Previous years questions papers and online practice sets. This section of JagranJosh.com provide an easy platform to the aspirants to buy premium resources like e-books , study material, online tests & other reference material for various competitive & entrance exams at a very nominal cost.